Is this an image of the war in Spain, or a premonition of even worse things to come? During the first three months of 1939, the cities of Madrid, Barcelona and Valencia fell into the hands of Franco's troops, while Hitler was making inroads into Eastern Europe. Picasso's mother died on 13 January. Political and personal events combined in his imagination to find expression in tormented pictures full of allegorical resonances. Picasso explained: "I did not paint the war because I am not the kind of painter who sets out looking for subjects, like a photographer. But there is no doubt that the war is present in the paintings that I did at the time. Later, perhaps, a historian will demonstrate that my work changed under the influence of the war." From pictures of women mourning the war victims in Spain, Picasso turned to visions of animals with ferocious expressions. Cat and bird are represented in two different versions: "The subject obsessed me, I don't know why", the artist later recalled. 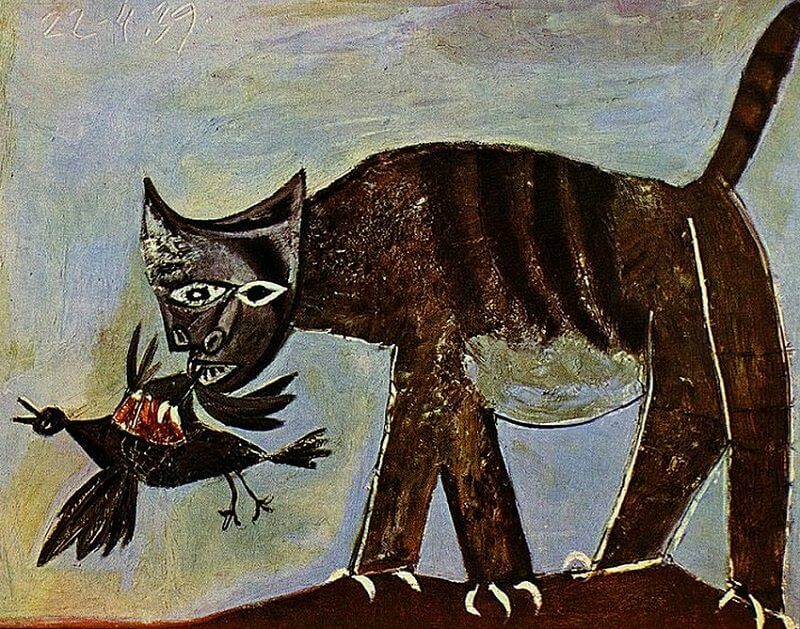 The cat in this picture is caked with mud-rendered by the admixture of sand to the paint - and holds a bird in its jaws. The bird struggles desperately to free itself from its tormentor's hold. The colour-scheme is muted; dull browns are punctuated with white streaks that accentuate the cruel claws, the glowing eyes, and the bird's damaged wing, which shows a raw wound. The neutrality of the background does nothing to relieve the horror of the scene: an image from everyday life blown up to apocalyptic proportions. The cat "stands menacingly on the threshhold of the times to come".